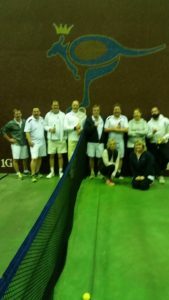 The annual Wanderers v BTC thrash was held on Saturday, 25th June with the wanderlusted team taking the honours to sneak ahead of BTC in the boasting stakes. A good range of play was on display with Bakers, Stranges and Jollys warming up for their European adventures later in the year, added to which Wanderer Nick Oates continued his family’s participation and Ben Jolly added some colour and youth! to the older stager Wanderer crew. 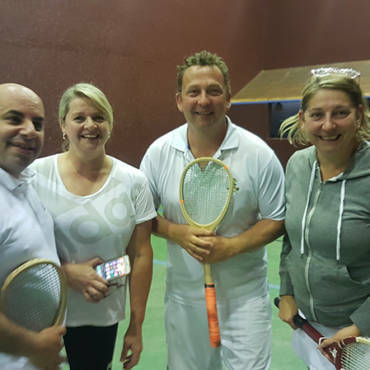 Some of BTC’s finest took them on including Jo Edwards, Bruce Christie, Michele Hoskin, Yvonne Rout, Greg Reid, Chris Alizzi, Mick Fenelon, Rod Unmack, Andrew Rowan, and Brenton Hardy. Wanderers by 7 matches to 4 and the less said about the BTC opening matches the better. They played like the Wanderers on a Sunday morning frankly! To be fair, Wanderers won two tight 7-6 matches and if the points had fallen the other way, so may have the overall result. It truly is a game of inches.